Members of the Oswego County War of 1812 Bicentennial Committee and Oswego City Mayor Thomas Gillen reveal the U.S. Brig Oneida Panel as part of the Great Lakes Seaway Trail Outdoor Storyteller Series. Pictured from left are Gail Goebricher, Friends of Fort Ontario; Jenny Emmons, Fort Ontario State Historic Site; Paul Lear, Fort Ontario State Historic Site; Oswego City Mayor Thomas Gillen; and Kelly Jordal, Oswego County Tourism Office. 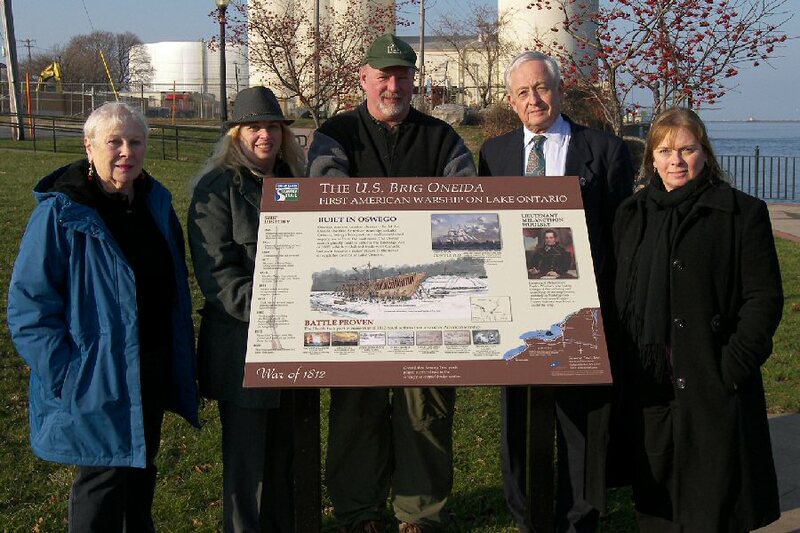 OSWEGO – A new interpretive panel of the U.S. Brig Oneida, part of the history-themed Great Lakes Seaway Trail Outdoor Storyteller sign series, was unveiled recently at the north end of Riverwalk West in West Linear Park. The location gives visitors the opportunity to envision this significant part of Oswego’s history in the War of 1812. The U.S. Oneida participated in the first battle of Sackets Harbor and the capture of the British schooner “Lord Nelson” in June of 1812; the capture of York (now Toronto), Canada in April 1813 and Fort George, Canada the following month; and the Niagara River blockades of 1814, before peace was declared later that year and the War of 1812 ended. Oswego County artist Robert McNamara worked with Lear and Dr. Gary Gibson, naval historian with the Sackets Harbor Battlefield Alliance, to produce an accurate account of the ship’s history. The Great Lakes Seaway Trail Outdoor Storyteller panels have been made possible through federal funding to Seaway Trail, Inc. of Sackets Harbor. The colorful series is open to the public year-round along the 518-mile national scenic byway that parallels the freshwater shoreline of the St. Lawrence River, Lake Ontario, Niagara River and Lake Erie in New York and Pennsylvania. The panels illustrate fascinating facts, legends and lore of historic, maritime, natural, cultural, agricultural, and architectural attractions throughout the byway region. 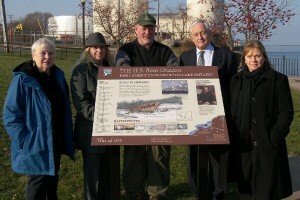 The U.S. Brig Oneida panel was installed by the Oswego City Public Works Department. It is one of several projects sponsored by the Oswego County War of 1812 Bicentennial Committee to provide information about Oswego County’s significant role in the war. Earlier this year, a painting of the warship by local artist Tim Ames was unveiled at the Oswego War of 1812 Symposium. Prints are available now at Lakeside Artisans, West First Street, Oswego. Schools, businesses, museums, libraries, municipalities and organizations are invited to display the painting on site and share this piece of history with residents and visitors. Mark your calendars to commemorate the 200th anniversary of the Battle of Oswego at the fourth annual Oswego War of 1812 Symposium, April 4 to 6, 2014.